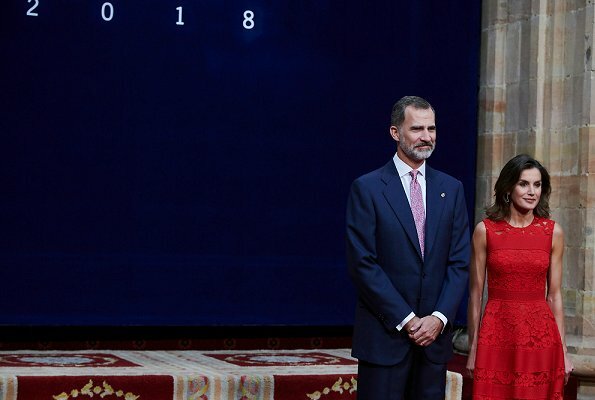 On October 19, 2018, King Felipe and Queen Letizia of Spain attended several audiences at the Reconquista Hotel during the 'Princesa De Asturias' awards 2018 in Oviedo, Spain. Queen Sofia also attended the event. 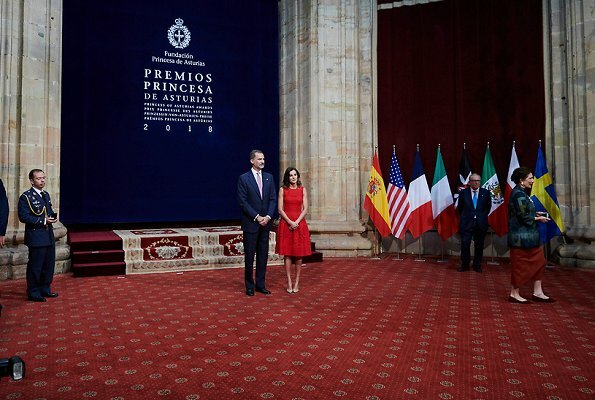 The Princess of Asturias Foundation presents the Princess of Asturias Awards with an academic ceremony held every year in Oviedo, capital of the Principality of Asturias. (Queen Letizia wore Carolina Herrera Lace Dress from Fall 2016 Collection, which she had worn in the past). Now this is a beautiful lace dress. Liked it in the past and today. Letizia looks great, fabulous dress and hair! 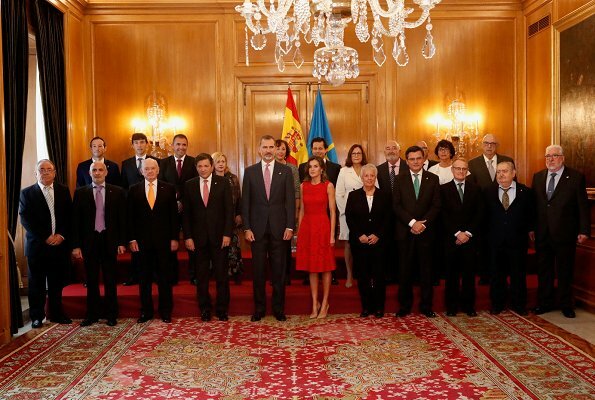 I love the fact that King Felipe tie mach with Letízia dress! What a lovely dress. Letizia looks stunning. So does Felipe. 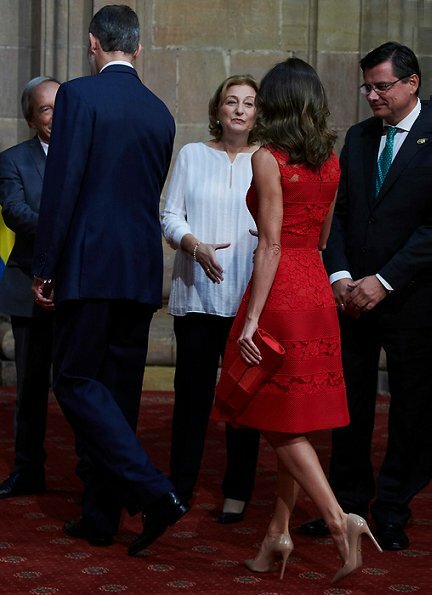 WOW, Reina Letizia en rojo y vestida por Carolina Herrera = belleza y elegancia absolutas. She can't wear the same every time, 3 engagements per way..
Beautiful red dress. Queen Letizia looks amazing. 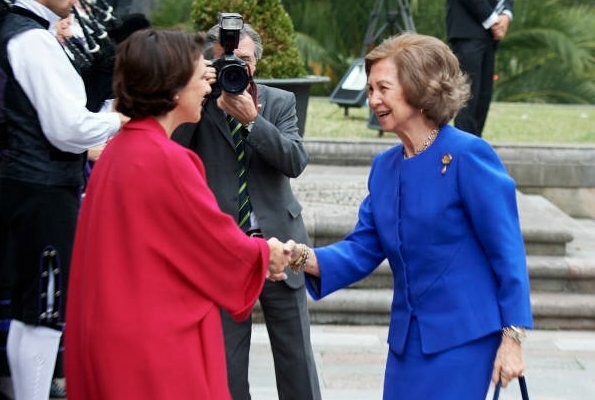 Also love Queen Sofia's bright blue outfit. She certainly has the toned arms to wear sleeveless dresses. Wow, stunningly beautiful! Red is always perfect color to her. Wonderful, as she usually is. Red is her colour. Love, love this red dress...and I hate lacy dresses. Her hair look also beautiful. Letizia looks great in sleeveless dresses. I love that she wears them as often as she can. This is also how lace should be done. It is a nice, modern take on lace.